Organized by the Sr. Beta Club, LCA students are busy packing “Operation Christmas Child” boxes for Samaritan’s Purse this week with a goal of 200 boxes this year! This is a great opportunity to get all LCA students involved this season and to remember what a blessing it is to give to others out of the abundance that God has given to us. Boxes are available to pick up in the main front office now and will be available on a first come, first served basis. All boxes should be returned FULL to LCA’s theatre on Thursday, November 8, or Friday, November 9. Below are a couple of specific, recent examples of other ways LCA students are serving others and helping our community! 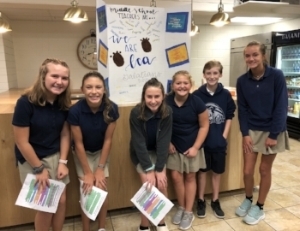 As a service project, some students from the seventh grade class chose to show their appreciation specifically to the MS teachers and facilities team as a token of their thankfulness for what they are the recipients of every day. At the end of their presentation, they asked each of these staff members to write something on a card that the class could do for them as acts of service. Below is a video clip of the students’ presentation to the teachers/staff. 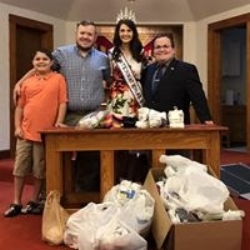 Kaylee Ewing, a 2014 graduate of LCA and Miss International pageant winner, spoke at Double Springs Baptist Church about her ministry of BRAVE. Their youngest active member is Gavin Moncada, a fourth grade student at LCA. His Sunday School class collected socks that Kaylee’s ministry will use in upcoming projects for the homeless in Athens and in foster care here in Loganville.